It’s unusual to paint pictures these days, for me, from someone else’s photographs. However, it keeps you challenged to produce a portrait you are happy with from a limited set of photos you didn’t direct or had a hand in choosing. In this one I had a few pics of the adults, a few of the boy on his own and one with the boy and dad. The task was to put all three in the one painting. I chose one pic of the boy and dad together in this setting and was able to place mum in the front and they all appear, I think, to be behaving as a group. I am curious to know where this is, a kind of pier come breakwater in a harbour in England I think. If anyone knows please let me know. This is in oils on board. My predominant colour here is Prussian Blue. 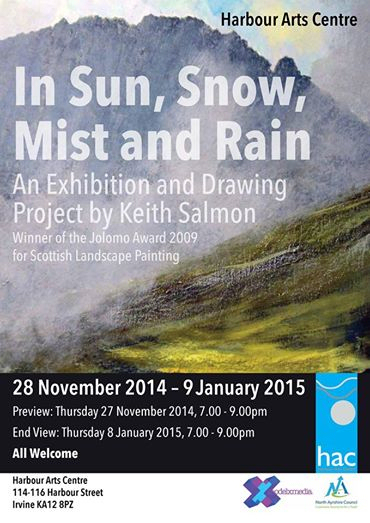 Keith Salmon has a new exhibition of paintings and a drawing project at the Harbour Arts Centre in Irvine this month. 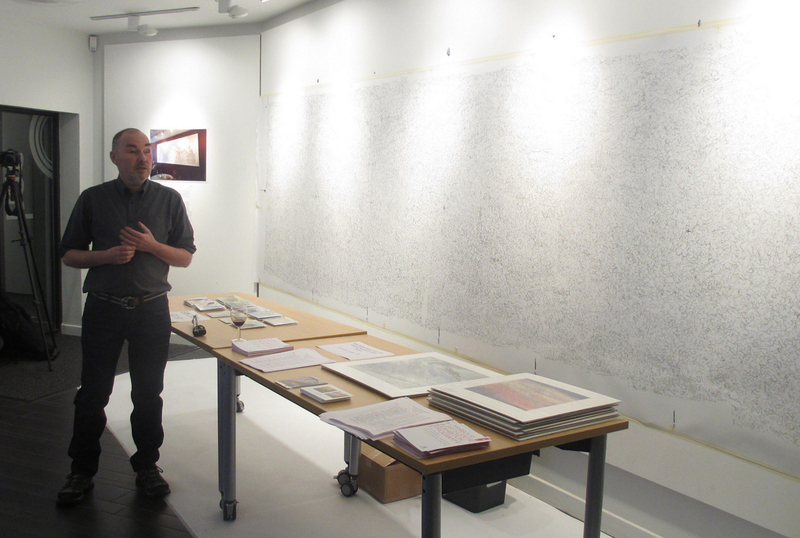 An exciting part of the show is Keith’s intention to work in situ on a large scale drawing of Glen Rosa, Arran. 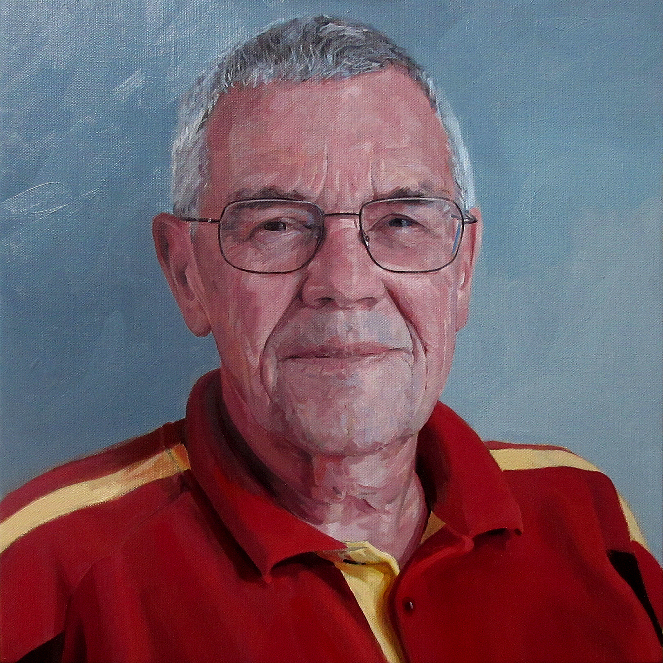 A walker and climber, he paints from memories, sketches and photographs of his experiences of weather and atmosphere in the hills. Walking in the giant natural amphitheatre of Glen Rosa, he envisioned an ambitious plan to draw the surrounding hills. It relates to an earlier project when he performed another public drawing of the external view of Speyer Cathedral in Germany. This time, contrasting with the external walk around a man made structure, he is inside the towering landscape of the natural walls of the mountains. 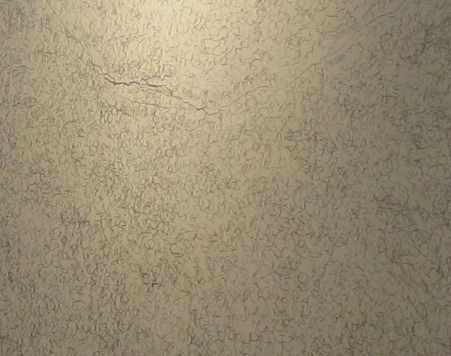 Here is a detail of the first stage of the drawing. Really an underdrawing so far, which he can build upon with layers and tones in the coming days. I’ll show progress as the drawing develops later in the month. 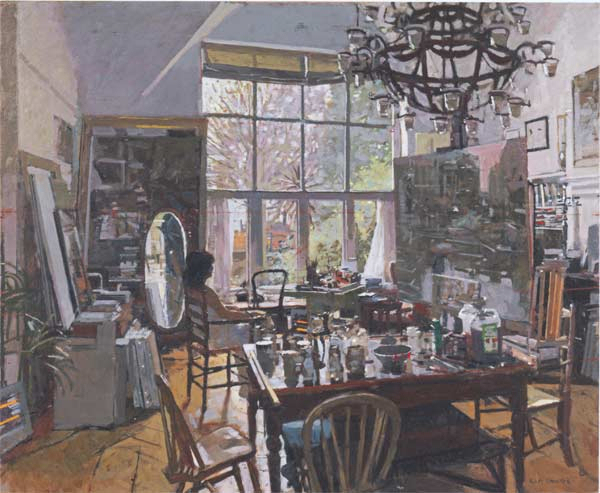 A special guest, Ken Howard, visited Troon Art Club last night for a great evening of stories and paintings. He was very entertaining, relating a life in the field as a plein air painter and one who always paints from life. He revealed he was a half Scot having a Scottish mother. I should have asked how he would have voted in the referendum! He has always been a favourite of mine. Painting the light rather than surface; what he sees rather than what he knows; getting to know, really know, a subject by revisiting the same scene. Thanks to Bobby Johnstone, the club programme director for luring Ken all the way from London. 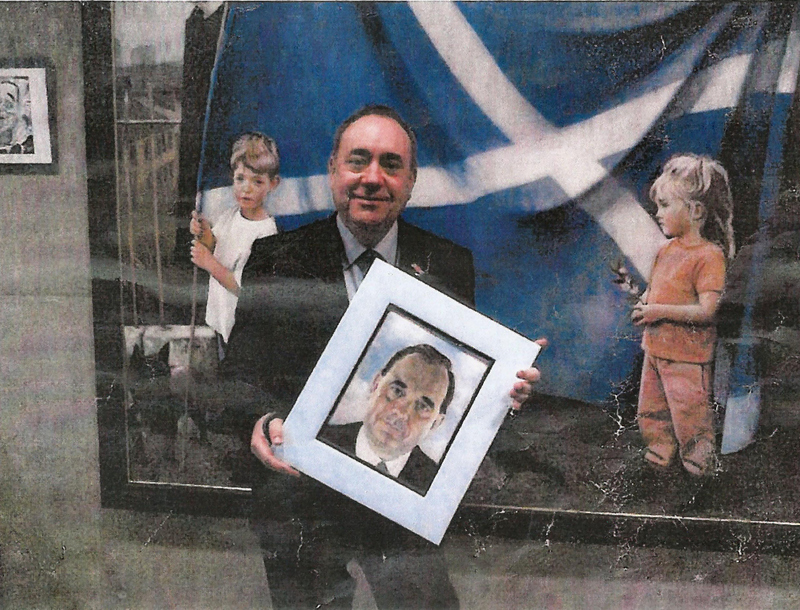 My friend and ex-student, Anna McGuire, had her portrait of Alex Salmond, the outgoing First Minister of Scotland, presented to the very man last week. He very kindly sent her thanks and this photo. 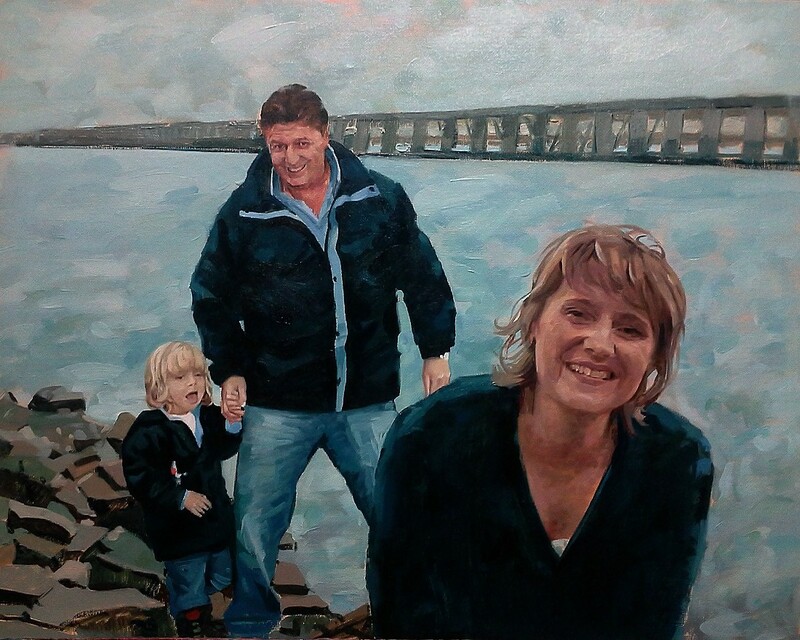 Anna has been a supporter of the SNP for years and is so pleased to be also offered an exhibition of her work at the Scottish Parliament. It is interesting to see Kate as a 5 or 6 year old to compare with the 17 year old portraying Mary. 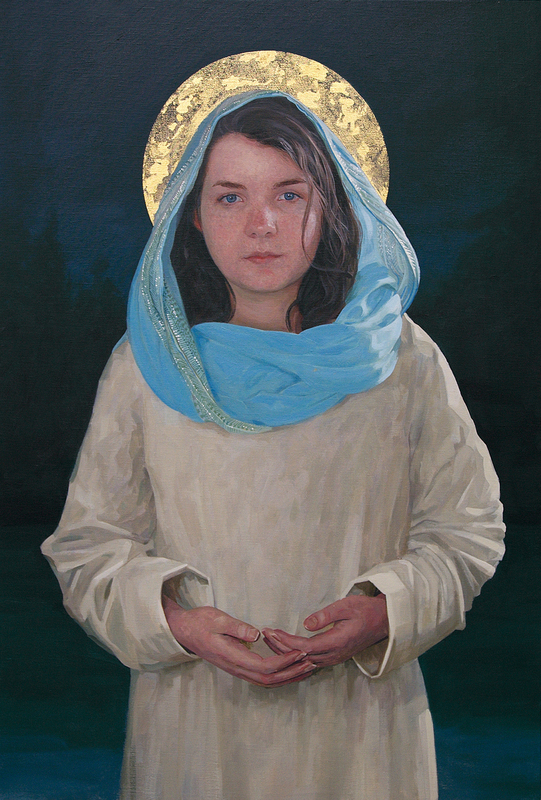 It is her ability to look straight down the lens with that relaxed gaze, even at this early age, that I knew I could rely on that same look to show the calm, humble, accepting Mary in the painting below. 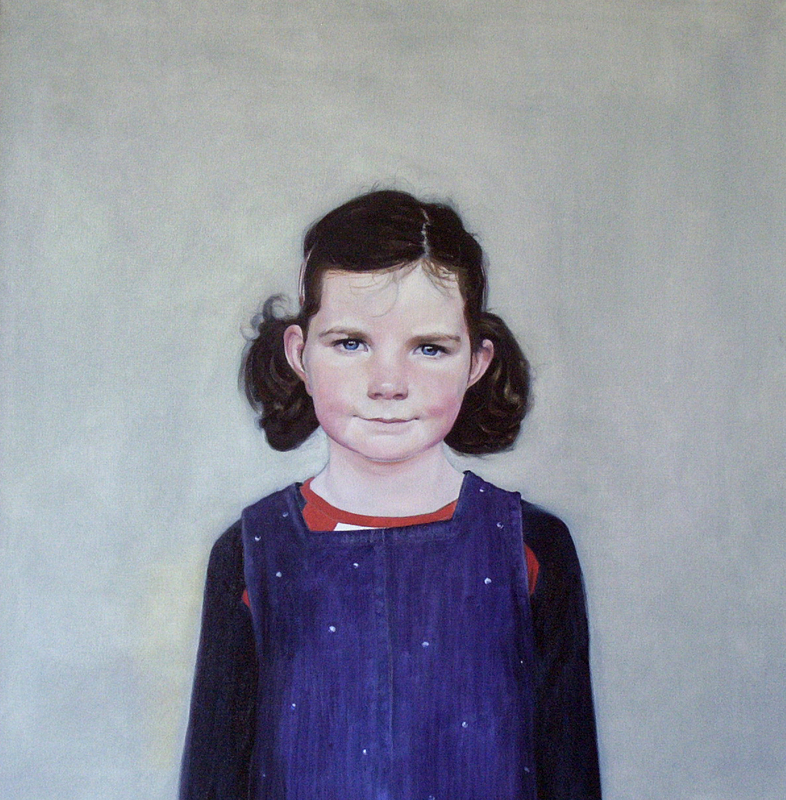 I will show the two paintings together at the studio this weekend before they part and lead separate lives. ( Open Studios weekend at Courtyard Studios, Irvine) I hope to put together a storyboard of sorts, to show the development from idea to the final image, via studies, photo shoots, conversations and inspirations. It will be thrown together but hopefully it will deceive as a thoroughly considered project! I have nearly finished my portrait of Mary, just a final refinement of tones to the hands and it should be complete, save for a “once over” to make sure. This one has taken me some time. There was a fair bit of toing and froing due to the nature of the commissioning process. Luckily, the client was sure of what he was asking for because any chance I could have had, I was for taking it to a more contemporary place. That will be for another time though. I have another two or three staged Mary’s all photographed and waiting for canvas. One thing the client stipulated was that he just wanted a depiction of the girl from Galilee. This will be heading for a church near home when it is framed in the next week or two. Fingers crossed it will go well with everyone involved.